From the street front the building is presented in it’s Sunday best offering the appearance of a proud, upstanding element of colonial New Zealand. But all is not as it appears and like the beguiling appearance of the moonshiners themselves, this building has also a darker side. Walk behind the pristine white picket fence, beyond the delicate ornamental fretwork, and the structure crumbles into something far more dishevelled and discourteous: a smoky, rusticated, ramshackle structure lurches out at an oblique angle from the main building. 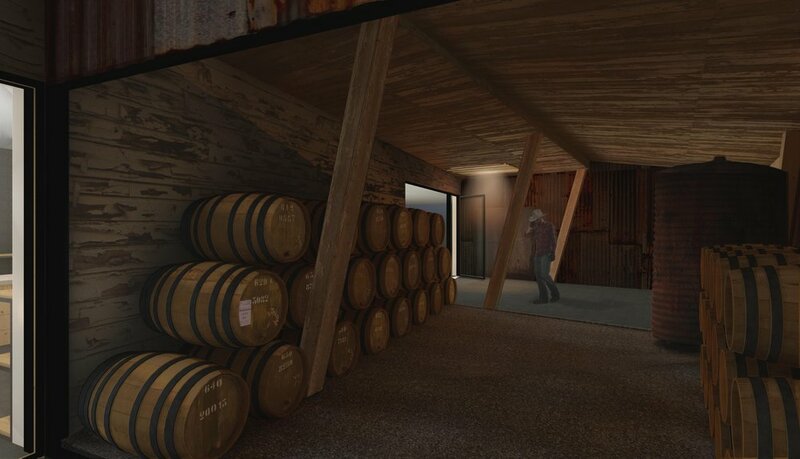 This is the new distillery and an important part of the redevelopment of the existing museum. Perhaps the most exciting element, however, is the distillery, where the whisky is created using the original nineteenth-century methods. During the day visitors may view the distillers at work from within the museum but at night the only suggestion of activity is the curious golden glow that seeps out between the planks of the boarded up windows.